Say Goodbye to Dropped Calls, Service and Slow Data Connections. If you're experiencing slow or lost calls, poor internet connection, stuck text messages, poor voice quality, weak coverage, low bars, and other Phone reception problems, a Cellular Mobile Phone signal booster is the best solution that produces definite results. A Yagi–Uda antenna, commonly known as a Yagi antenna, is a directional antenna consisting of multiple parallel elements in a line, usually half-wave dipoles made of metal rods. Yagi–Uda antennas consist of a single driven element connected to the transmitter or receiver with a transmission line, and additional "parasitic elements" which are not connected to the transmitter or receiver: a so-called reflector and one or more directors. Description: Features Directional antenna Mounting hardware included for fixed installations. Specifications Part Number 301124 Number of Elements 9 Frequency 1800-1990 MHz Impedance 50 ohms Antenna Gain 15 dBi Maximum Power 25 watts Polarization Vertical or Horizontal Connector N Female Length 16.8 inches/43cm (with mount) Weight 3ounces/ 0.086kg (with mount) Material Aluminum Wind Surface Area <120cm Brackets Max OD 2 inches. An omnidirectional antenna is a class of antenna which radiates radio wave power uniformly in all directions in one plane, with the radiated power decreasing with elevation angle above or below the plane, dropping to zero on the antenna's axis. Description: Part Number 301113 Frequency Range 806-894 MHz / 1850-1990 MHz Impedance 50 ohms Antenna Gain 2.12 dBi 806-894MHz / 3.12 dBi 1850-1990 MHz Radiation Omni Polarization Vertical Wavelength 1/4 Wavelength 806-894 MHz / 9/16 Wavelength 1850-1990 MHz Ground Plane Metal ground plane required Connector FME Female Material Whip - Plastic-Coated Steel Wire Coax Cable RG174 - 10 feet / 3.05 meters Height 4.175 inches / 10.60 cm Mount Rare earth magnet. Description: Part Number 301103 Frequency Range 806-894 MHz / 1850-1990 MHz Impedance 50 ohms Antenna Gain5.12 dBi 806-894MHz / 6.12 dBi 1850-1990 MHz Radiation Omni Polarization Vertical Wavelength 0.9 Wavelength 806-894 MHz / 2.0 Wavelength 1850-1990 MHz Ground Plane Metal ground plane required Connector FME Female Material Whip - Stainless Steel Coax Cable RG174 - 10 feet / 3.05 meters Height 12.25 inches / 31.12 cm Mount Rare earth magnet. Description: Part Number 304202 Frequency Range 806-866 MHz / 896-939 MHz / 1850-1990 MHz Impedance 50 ohms Antenna Gain 5.0 dBi 806-866 MHz / 896-939 MHz / 1850-1990 MHz Radiation Omni Polarization Vertical Wavelength 0.9 Wavelength 806-866 MHz / 1.05 Wavelength 896-939 MHz / 2.0 Wavelength 1850-1990 MHz Ground Plane Metal ground plane required Connector FME Female Material Whip - Stainless Steel Coax Cable RG174 - 10 feet / 3.05 Meters Height 12.25 inches / 31.1 cm Mount Rare earth magnet. Description: Small size antenna. Ultra thin, great on mobile application. 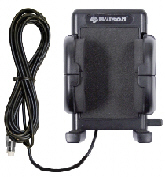 Works with Wilson Mobile Wireless or SIGNALBOOST amplifiers (sold separately) to boost your signal up to 10 times that of most cell phones. Compatible with all cell phones Increases driver safety. Supports any hands-free device, including ear-buds and Bluetooth® products. Adjustable to fit any size cell phone. Multiple mounting options: console, dashboard or windshield. Installs in minutes!